Well wow. Winter arrived this week like a dinner guest who shows up drunk in time for dessert. There was some snow, which I’m grateful for, but we plunged from above freezing to single-digit (that is fahrenheit) temperatures within an hour or two. All hell broke loose as the roads glazed over with black ice. It’s been snowing and below zero at our house for a few days now. 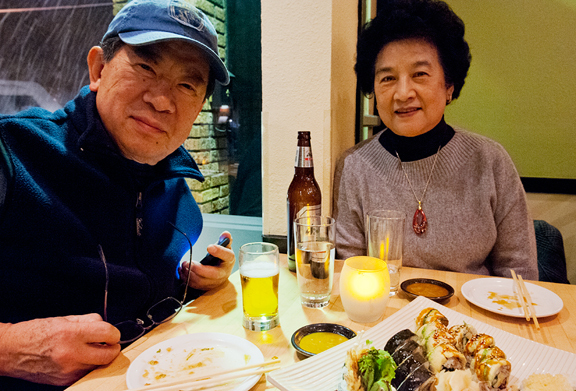 My parents made it safely home to Virginia and I think they were relieved to not have to deal with snow and ice. We never got above zero today (Wednesday) at our house, but it should start warming up soon. I’m ready for more snow, I tell ya. It’s time to get the ski pants out. I’ve also been looking for reasons to cook things in the oven now that we have finally entered cold weather season. Can you believe I’ve never made cottage pie before? I wasn’t even sure what it was. But once I read through the recipe, it was clear to me that THIS is my kind of pie – a savory pie with mashie top! 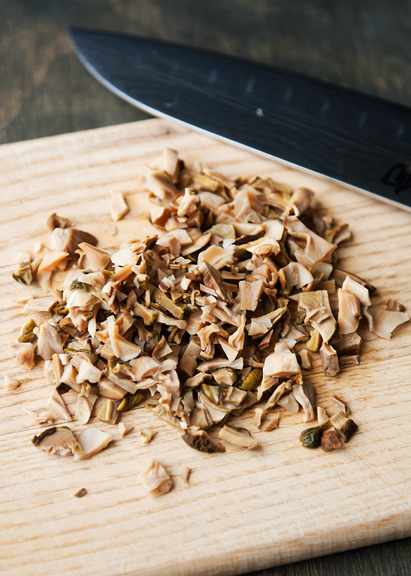 The dried porcini should be easy to find in most well-stocked grocery stores if you don’t have your own stash from summer foraging. 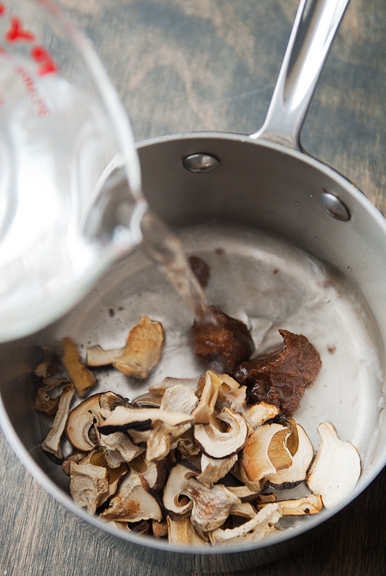 The broth will become infused with the porcini essence – precious thing that it is – so don’t you dare toss that out! It goes into the stew. But you might want to strain it through a fine-mesh sieve to remove any sediment or grit that might have come off the mushrooms. While the mushrooms steep, you can season the steaks and sear them. 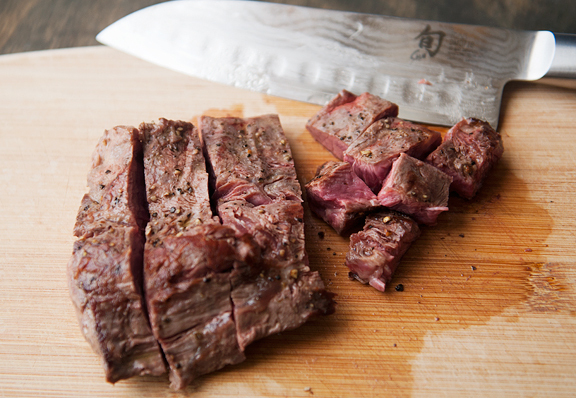 Flatiron or blade steaks come from the shoulder of the animal – beef chuck. 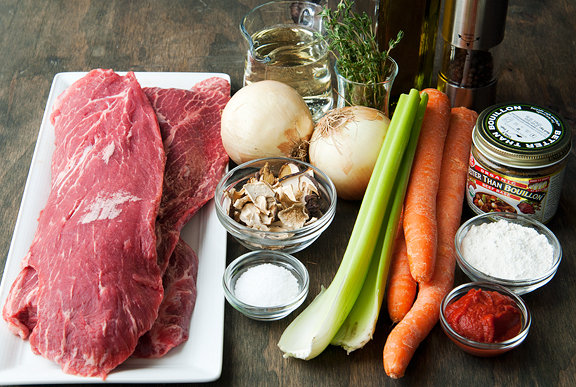 The meat is tougher than your premium cuts, but this cut has great flavor and the beauty of the recipe is that you braise the beef until it is tender. 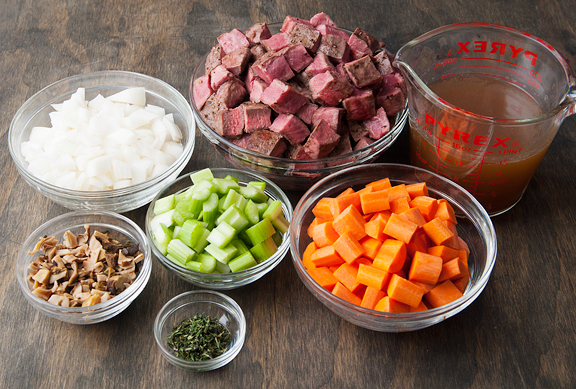 When you dice the beef, be sure to catch any and all juices to add to the stew. 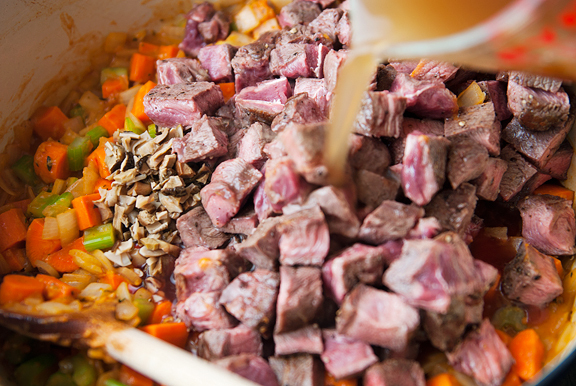 Using the same pot in which you browned the beef, sauté the vegetables and add in the flavorings and liquids. While there are vegetables in the recipe, I didn’t feel there were enough for my taste. I guess this happens a lot – that I think the meat to vegetable ratio is too high. I increased the amount of vegetables in the recipe below, but I include what the original amounts were in parentheses just in case you are a caveman and can’t bear the thought of biting into a carrot or celery. The beef braises for an hour, so that should be plenty of time to ready the potatoes. I used yukon gold potatoes, because those are my favorite, but you can use russet or whatever your favorite mashing potato is. The original recipe dices the potatoes before boiling them. I prefer to boil my potatoes whole (in a pressure cooker, but you can boil them in a regular pot too). As long as they don’t break open during the cooking, they should remain nice and fluffy on the inside. 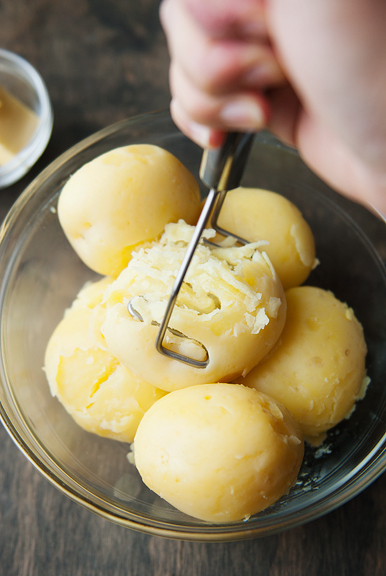 Take care not to overmash or overwork the potatoes because this makes them gluey instead of fluffy. And I doubled the amount of potatoes because… well, mashies! When the stew and potatoes are done, you can stop at this point and refrigerate the two components if you are making the dish ahead. Pour the stew into a buttered baking dish and then top it off with the potatoes. You can spread an even layer of potatoes on top or you can get fancy pants and pipe the potatoes. Just make sure you have a piping tip that is big enough to accommodate potato lumps or else the mashies are going nowhere. The baking time is 35-45 minutes, but if you made the stew and potatoes the day before and it’s all cold, give it an extra 10 minutes in the oven. The potatoes will brown on the tops a little bit and the part that is in contact with the stew will absorb that savory deliciousness that would be the “gravy” – a combination of beef broth, beef juices, porcini, wine, and aromatics. Also? Your house will smell like heaven. 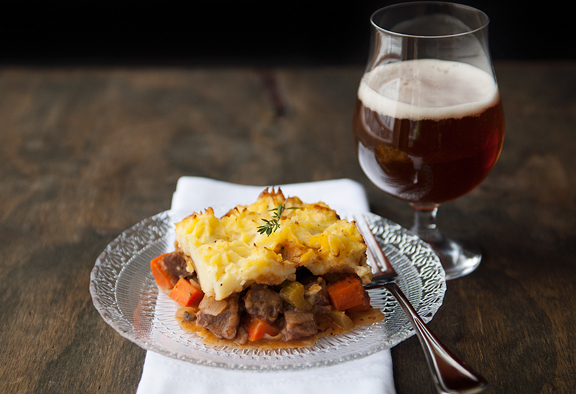 Cottage pie retains its heat quite well and it has been a perfect dinner for these cold, snowy evenings. I’m sure it will be perfect for future cold, snowy evenings, too! 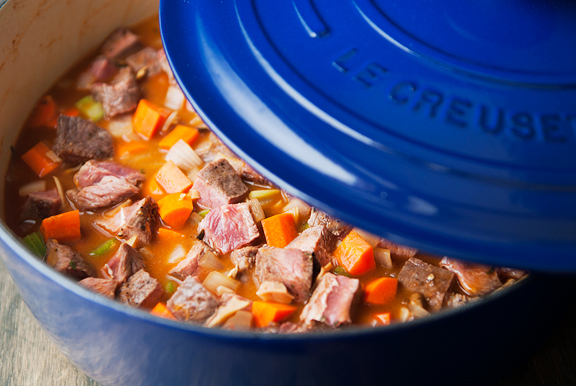 Make the stew: Set a rack in the center of your oven and preheat to 350°F. Place the broth and porcini in a small saucepan over medium-high heat. Bring the liquid to a simmer, cover with a tight-fitting lid, and turn the heat off. Steep the mushrooms for 15 minutes. Remove the mushrooms from the broth and chop them up. Strain the broth through a fine-mesh sieve (to remove any sediment from the mushrooms) and reserve the liquid. 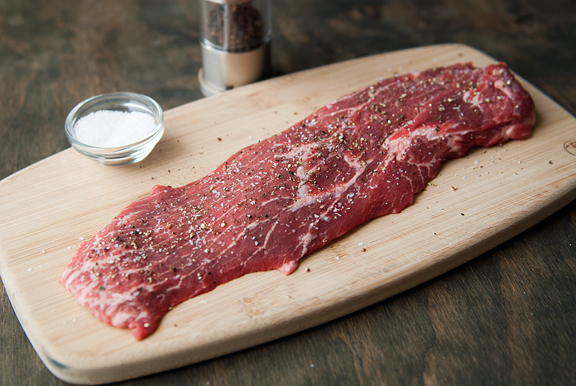 Pat the steaks dry and season with salt and pepper on both sides. 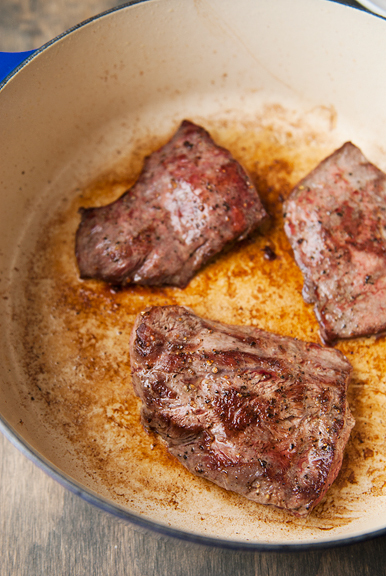 You might have to cut the steaks in half (like I did) to fit them in your Dutch oven. Heat 2 tablespoons of olive in a shallow Dutch oven or stew pot over medium-high heat. Sear the steaks 3-4 minutes per side until browned. Sear in batches as they probably can’t (and shouldn’t) all fit in the pan at once. Remove the steaks to a plate (make sure you catch all of the juices as they rest). 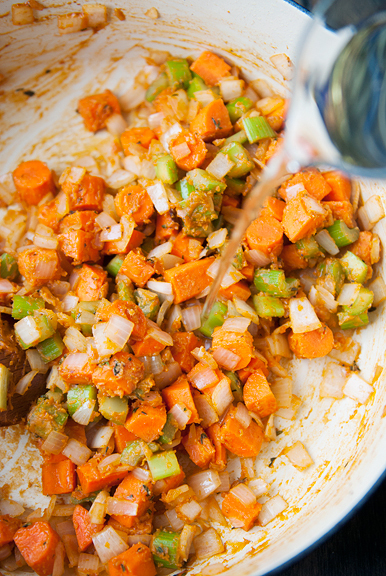 Lower the heat to medium and add 1 tablespoon of olive oil to the Dutch oven or stew pot. 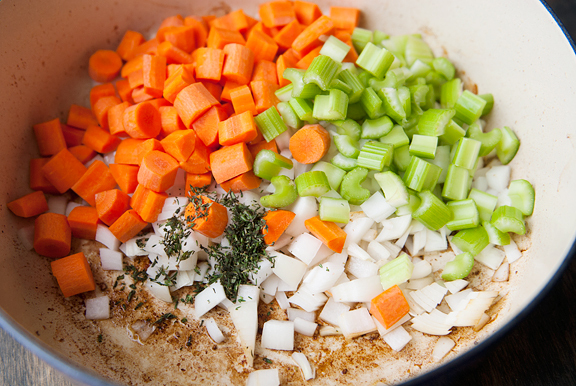 Sauté the carrots, celery, onion, thyme, and salt and pepper (to taste) until soft – about 7 minutes. Meanwhile, cut the beef into 1/2- to 3/4-inch cubes. 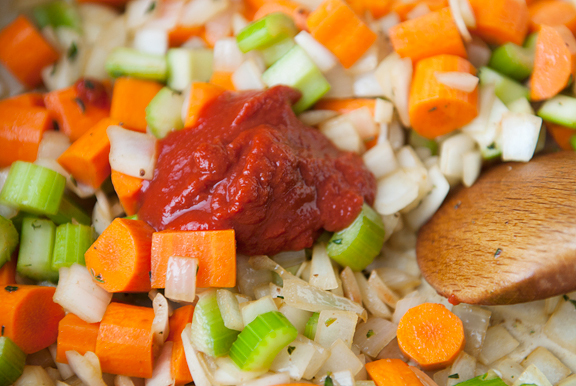 Stir the tomato paste into the vegetables and cook for 2 minutes. Stir in the flour, cooking for another minute. Add the wine and let it come to a simmer. 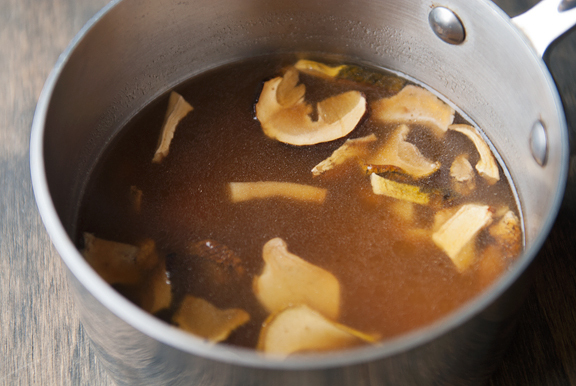 Reduce the heat to low and stir in the porcini, broth, beef, and any beef juices. Cover the pot with a tight fitting lid and let it braise in the oven for an hour. When the beef comes out of the oven, season with salt and pepper to taste. 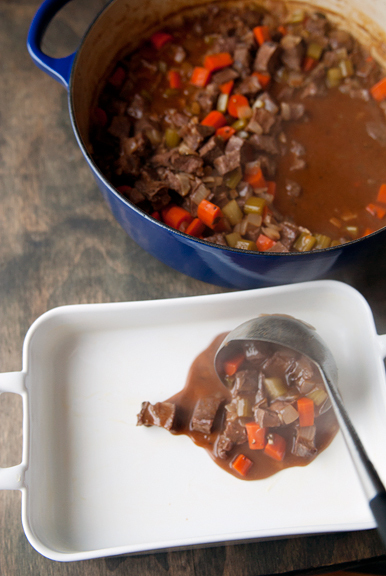 Set the stew someplace warm or you can refrigerate it at this point if you are making it ahead. 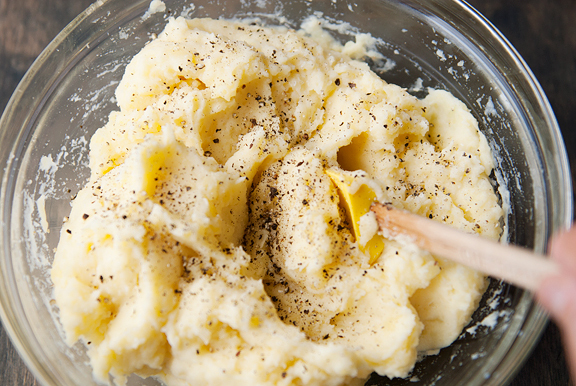 Make the mashed potatoes: Place the potatoes (whole and unpeeled) in a large pot or pressure cooker. Fill the pot with cold water so that it is 2 inches above the tops of the potatoes. Add a teaspoon of salt to the water. If using a conventional pot, bring the water to a boil then reduce to a simmer and let cook for 10-20 minutes until the potatoes are tender all the way through. If using a pressure cooker, I set my Fagor Duo to high (setting 2) over high heat. When pressure is reached (my yellow button pops up), cook for 5 minutes, then turn off the heat. Let the pressure cooker release naturally (just let it decompress on its own). 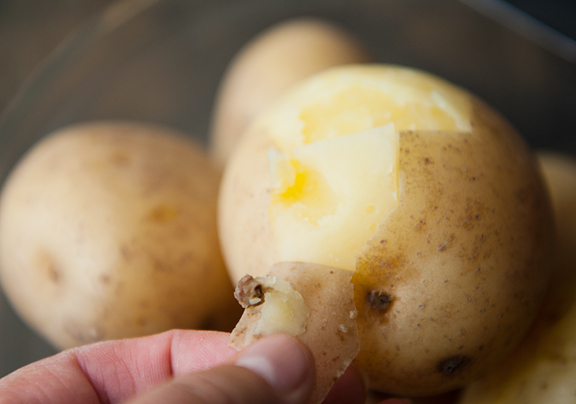 Remove potatoes from the pot when done cooking and peel the skins off. 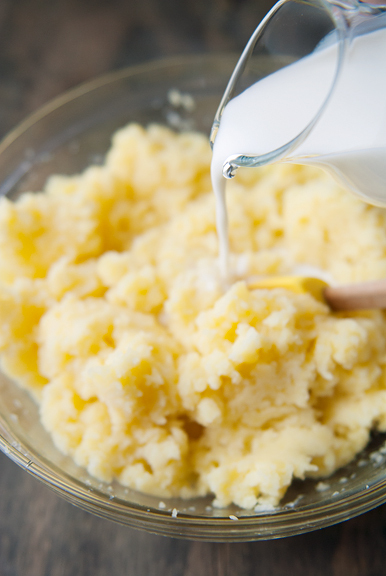 Mash the potatoes with the 10 tablespoons of butter. Stir in the milk or cream a little at a time. Season with salt and pepper. 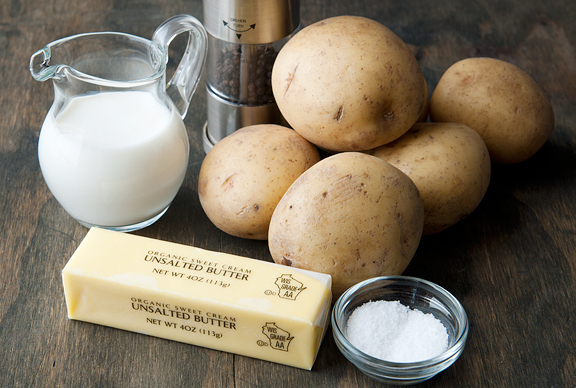 You can refrigerate the potatoes if making ahead. Assemble the pie: Heat the oven to 375°F. 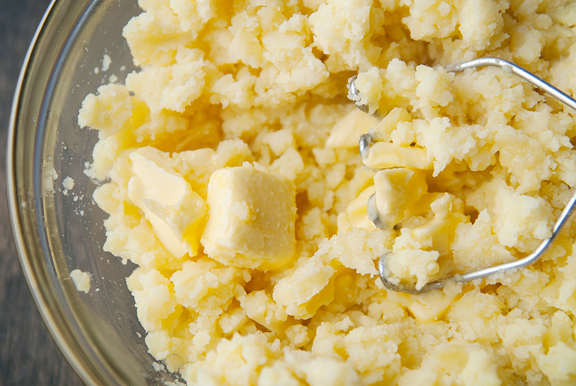 Butter a 3-quart baking dish (or any combination of individual pie plates or ramekins, etc.). Pour the stew into the dish. Top with the potatoes, spreading them evenly over the stew. Dot the potatoes with the pieces of butter. Bake for 35-45 minutes (or 45-55 minutes if the ensemble was refrigerated). Serves 6-8. So comforting and scrumptious! 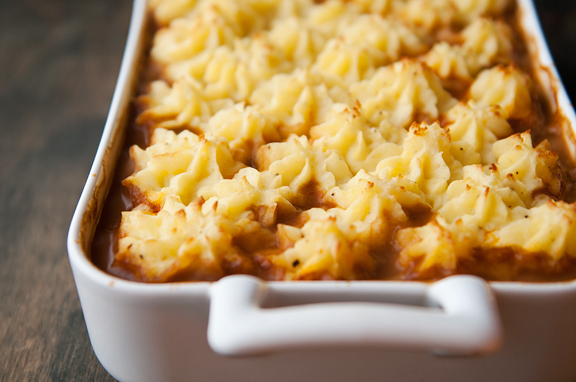 Your cottage pie looks fabulous. This looks so good! Perfect for a cold winter’s day. Recently I ran across another recipe for Cottage Pie and made it. My resident physicist loved it too! I’ll try your version next time. Because of your inspiration (not unusual) I made mine entirely in the pressure cooker. The basket was perfect for the potatoes and the stew went underneath. I’ve made a vow to use my pressure cooker more often this winter. 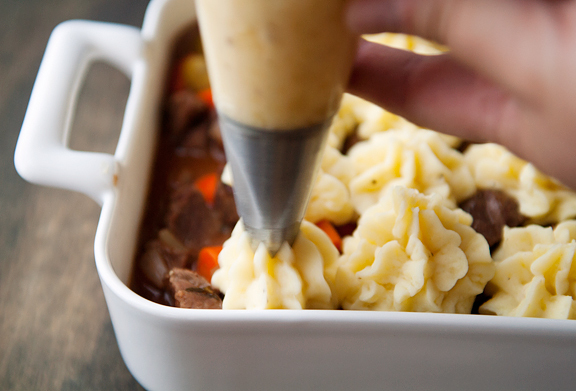 Pressure cooker and oven — it’s a perfect Wintertime double whammy! Enjoy the snow! Ok, that looks really delicious but, the weird thing is, my nose is all stuffed up & I gave a big sniff to try to clear it (because it’s too cold & I’m too tired to get up & see if blowing into a tissue would help) and I SWEAR I smelled beef when I was looking at the picture of it all in the pot. Do you invent a scented blog without telling us? So the stew part smelled enticing, but when you added the mashed Yukon Golds???? Irresistible! Looks awesome! I can taste it now! I’ve been a long time reader/lurker and have made a few of your recipes, which have always turned out amazing! I had to comment on this because I’ve been wanting to make shepherd’s pie for a few days now, and then you post a recipe for it! The great pictures make me want it NOW! Ooooh that looks so good for the cold weather that seems to have finally arrived in the Northeast as well. Maybe I’ll get the components done on Sunday so we can pop it in the oven on Monday…YUM. This looks so yummy and I think I can pull it off. I’m printing it now and looking forward to making it this weekend. I’ve never seen a recipe that calls for you to brown then dice the meat before adding it to a stew but it looks like a really good idea and something I’ll have to try. 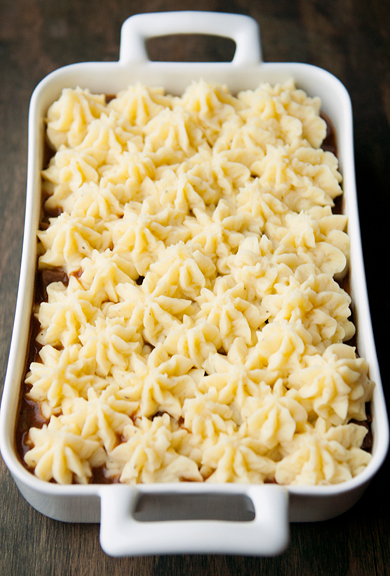 I make cottage pie quite often in the winter as well a shepherds pie (made with lamb which is lovely with sweet potato mash or garlic mash) and sometimes a version with venison and red wine and celeriac-potato mash. What brand is that white casserole dish you’re using in the pictures above? Here in New England there’s a similar dish called Shepard’s Pie. Hi Jen, I know this is still super early, but I immediately thought of you when I saw this plea for adopters on the Susie’s Senior Dogs instagram account for older girl Megan in Montreal. They were asking for a no kids household with very active owners and it seemed like they were describing you two. Believe me, I know it’s early–I cried right there with you when I found out about Kaweah–but I also adopted my current pup only a month or two after my last one got sick and died. Although it was still very raw and felt way too soon, seven years later I could not imagine my life without her now. Either way, I wanted to bring Susie’s account in the spotlight, because their cause of highlighting senior pups in shelters is so great. Take care! Rosa – thank you, my dear! Nan – wonderful! I love using my pressure cooker when possible. It makes the meat so tender with so little effort! Christine – I hope you made it and enjoyed the dish! Tamsin – wow, you sound like a pro at making these meat pies with mashy top :) Thanks for all of the great ideas. I too was a little curious about browning and dicing the beef, but it worked well. Stacey – that is a Revol and they are ridiculously expensive (but I love mine). farmerpam – yes! With lamb, right? Christine – Thank you for thinking of us, but really we’re not looking to adopt just any dog (and especially not right away). We cared for Kaweah in her old age for 2+ years. That was 2 years of carrying her up and down stairs, almost 2 years of not being able to travel, 2+ years of having to leave her at home while we went out to ski or hike or run or bike, several months of cleaning up accidents that she couldn’t help. I loved Kaweah dearly, but neither of us wants to do that again any time soon if we can help it. We want an active dog because we are active people, but we want an active dog that can be active for a decade, not a year or two. We just aren’t the type of dog owners who go into this decision lightly, as I think you know. There are lots of things for us to consider before getting another dog. We go into it with all our hearts and will see that pup through to the end as best we can. 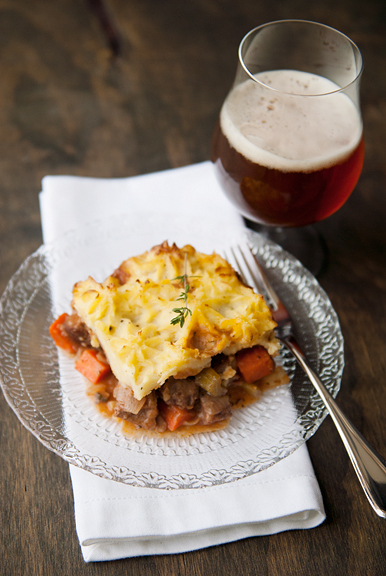 We used to make Hamburger Pie all the time when I was a kid (which is just cheap Shepherd’s Pie). The main difference is that you layer the meat, then veg, then potato and bake. And it’s ground meat, either beef or lamb.